We research the top eCommerce Shopping Cart solutions so you don't have to. Based on our research, we attempt to create a solution that is affordable, flexible and has little or no recurring costs. We don't actually consider this the most important item to evaluate about an eCommerce shopping cart solution. Any business owner will tell you that they want the best value for their money, not necessarily the cheapest solution. But we are continually surprised by some of the unfair pricing practices of eCommerce shopping cart vendors so we felt it necessary to mention this one first. Most eCommerce shopping carts available require you to pay monthly fees. Sometimes the fees are as low as $29.95 per month, others are as high as $79.95 per month or more. Why should you have to pay a company every month for the ability to sell products over the Internet? 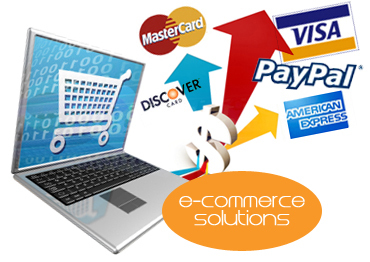 We charge you one affordable fee to setup a complete eCommerce solution and you never need to pay us another penny. In addition to a setup fee, some eCommerce shopping cart solutions charge you monthly fees based on the number of products you offer. We even found one solution that charges based on your sales each month. You should not be penalized for having an extensive product line or for being very good at selling those products. With our solution, you can list as many products as you want in as many categories as you want and sell as many units as you can, without worrying about incurring any further fees with us. 3. Turn-Key Solution — No Technical Knowledge Required"Turn-Key"
This is simply an industry buzzword meaning that the solution we deliver to you is ready for use and there is nothing more you need to do to get it to work. By the time we hand over the solution to you, it has been integrated into your web site and it has been connected to a payment service (like a credit card processing company). All you need to do is enter your product information and start selling. If you don't already have a web site in place, we'll take care of that as well. We'll create some graphics to provide you with a unique look and feel and we'll setup an "About Us" page and a "Contact Us" form so that instead of just a shopping cart, you will have a complete web site solution. Any good shopping cart solution will allow you to customize it in obvious ways, such as colors, fonts and even layout. But what if there is a particular feature you need to have that is critical for your business? Maybe there's a particular way you calculate shipping costs or perhaps you want to categorize your customers in various ways and offer different pricing based on the customer type. Most shopping carts will not give you this level of customization. Our shopping cart is an internally-developed Chaney Systems solution (which means it is relatively easy for us to make the changes you may require because we developed it). There is a large community of websites at Chaney Systems that request new features from time to time. When new features are implemented, the whole community benefits from the enhancements. ead, it is last because most shopping carts you can purchase do provide quite a number of useful features. Checking the feature list of a shopping cart is really just a sanity test to make sure the shopping cart isn't missing some obvious, but important feature.